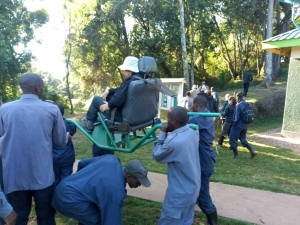 Your 5 days Volcanoes National Park gorilla safari Rwanda is a popular safari in Rwanda to the single home to mountain gorillas in the country. This safari features gorilla trekking, golden monkey trekking, a visit to the Dian Fossey center, Musanze caves walks and a Kigali city tour. Volcanoes national park is the only national park in Rwanda that hosts mountain gorillas and the popular park for all Rwanda gorilla safaris. The park has about 400 mountain gorillas living within the 5 volcanic mountains of the volcanic chains. Within the same massif is situated Virunga national park for Congo gorilla safaris and Mgahinga national park for Uganda gorilla trekking safari alongside Bwindi impenetrable national park. Day 1: Your professional Rwanda safari driver guide will pick you up at Kigali international airport upon arrival and transfer to Volcanoes national park. 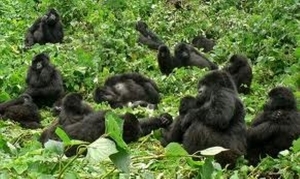 Day 2: You will go for gorilla trekking in Volcanoes national park. 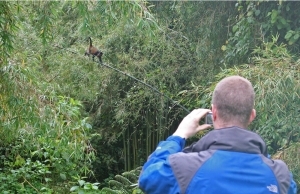 Day 3: You will do golden monkey trekking and Musanze caves walk. Day 4: Learn more about mountain gorillas by visiting the Dian Fossey Fund International. Day 5: You will do a short Kigali city tour then return to Kigali international airport for your departure flight. The moment you arrive at Kigali international airport, your driver guide will pick you up and transfer you to your booked accommodation in Volcanoes national park. Here you will relax, have dinner and an overnight. You will have breakfast at your lodging facility then be driven to the park headquarters for briefing before 8:00am. During the brief, the park rangers will allocate you a gorilla family to trek along with 7 other trekkers for about 2-5 hours. 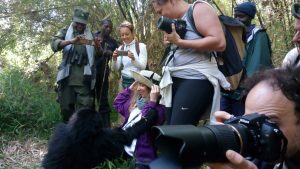 Only 1 hour can be spent in the presence of the gorillas and following strictly the gorilla trekking safari Rwanda rules is key on this safari. After trekking, you will return to the park headquarters where you will meet your driver guide who will return you to your accommodation facility for relaxation, dinner and an overnight stay. After a hearty breakfast in your lodging facility, your driver guide will drive you to Volcanoes national park for golden monkey trekking. 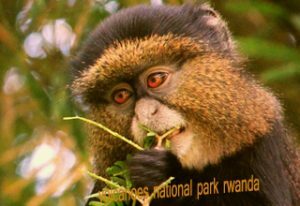 In East Africa, golden monkeys are only in the Virunga massif and while on a tour in Rwanda this is the only chance to trek these beautiful creatures. The trek lasts about 2-4 hours before you return for lunch. In the evening you will go for a Musanze caves walk and go through these beautiful nature sculptures. During this trek you can’t guess what luck will offer to you that day. 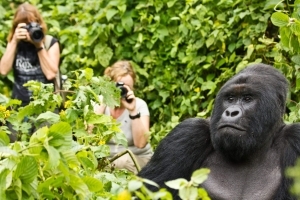 On this 4th day of your Rwanda gorilla trekking safari, you will visit the Dian Fossey center. Dian Fossey started this foundation alone with efforts to conserve the mountain gorillas. Visiting the center is a sign of a tribute visit to someone who spent her whole life conserving gorillas that many tourists today love to trek. During the visit her you will learn a lot about gorillas from their character, eating habits, social life to reproduction and much more. In the evening you will go to lake Kivu and relax. On this last day of your Rwanda safari you will have relaxed breakfast, go for a short Kigali city tour and do craft shopping in case you need to. You can visit the Gisozi genocide memorial center and learn about the history of Rwanda. Your driver guide will later transfer you to Kigali international airport for your departure flight. Rwanda is known as the land of a thousand hills not just because of the hills but because of the beauty in these hills. 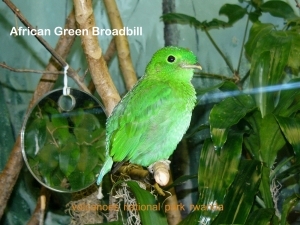 Take a 5 days safari and visit one of the rare species of the wild.